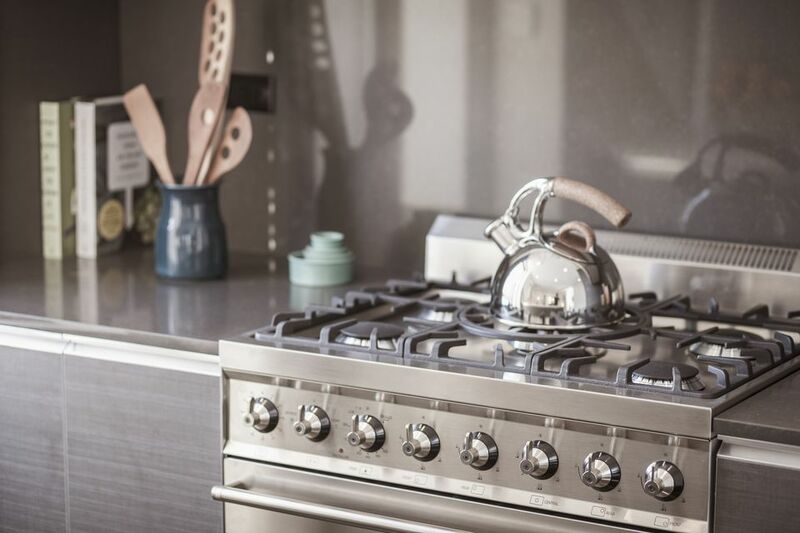 Stainless steel is known for its ability to resist corrosion and rust, which is why it's a popular choice for kitchens and bathrooms. However, dirt, dust, and grime, can put stainless steel at risk for corrosion and rust. Luckily, it responds well to cleaning, as long as you follow certain rules. The key to keeping stainless steel stainless clean is proper care and maintenance. In general, it's best to start with basic cleaning and work your way up as needed. With just a little effort, your appliance or countertop will shine on! This group of supplies will provide you everything you need for several different methods of cleaning stainless steel. Wipe surfaces with a microfiber cloth moistened with warm water. Warm water and a cloth will be sufficient for most routine cleaning. This is the least risky option for stainless steel, and plain water really is your best cleaning option in most situations. Dry the surfaces towel or cloth to prevent water spots. This is very important since minerals in water can leave marks on stainless steel. Wipe in the direction of the metal grain when cleaning or drying. This will help prevent scratches and create a polished finish on the metal. For cleaning that needs a little more power, a drop of mild dish detergent and warm water can do a great job. This combination will not damage your stainless steel and it's generally all you need to get the tougher dirt off. Add a few drops of dish soap to a sink full of warm water. Another option is to put a small drop of dish soap on a microfiber cloth, then add warm water to the cloth. Wipe down the stainless steel with the cloth, rubbing in the same direction as the grain in the metal. Rinse the surface thoroughly after washing away the dirt. Rinsing will help prevent staining and spotting due to soap residue. Towel-dry the metal to prevent water spots. Fingerprints are one of the biggest complaints about stainless steel. You can take care of them by using glass cleaner or household ammonia. Spray the cleaner onto a microfiber cloth. You can spray directly on the stainless steel, but this can cause drips and may waste the cleaner. Wipe the area gently in a circular motion to remove fingerprints and stains. Repeat as needed. Rinse thoroughly, then towel-dry the metal finish. There are some newer types of stainless steel finishes that resist fingerprints. This might be something to consider if your pint-sized helpers tend to leave their marks everywhere. If you have stains that are difficult to remove or scratches on the surface, a stainless steel cleaner may be a good option. Some of these cleaners both remove stains and protect against scratches They can also be used to polish surfaces. Read and follow the directions carefully, and be sure to test the cleaner in an inconspicuous spot first. When you're done, rinse the area thoroughly and towel dry. What Are the Easiest Ways to Get Glass Clean and Sparkling?